A neon lamp (also neon glow lamp) is a miniature gas discharge lamp. The lamp typically consists of a small glass capsule that contains a mixture of neon and other gases at a low pressure and two electrodes (an anode and a cathode). When sufficient voltage is applied and sufficient current is supplied between the electrodes, the lamp produces an orange glow discharge. The glowing portion in the lamp is a thin region near the cathode; the larger and much longer neon signs are also glow discharges, but they use the positive column which is not present in the ordinary neon lamp. 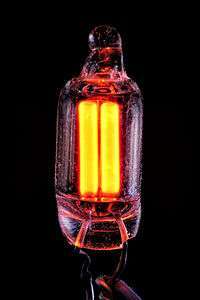 Neon glow lamps are widely used as indicator lamps in the displays of electronic instruments and appliances. Neon was discovered in 1898 by William Ramsay and Morris W. Travers. The characteristic, brilliant red color that is emitted by gaseous neon when excited electrically was noted immediately; Travers later wrote, "the blaze of crimson light from the tube told its own story and was a sight to dwell upon and never forget." Neon's scarcity precluded its prompt application for electrical lighting along the lines of Moore tubes, which used electric discharges in nitrogen. Moore tubes were commercialized by their inventor, Daniel McFarlan Moore, in the early 1900s. After 1902, Georges Claude's company, Air Liquide, was producing industrial quantities of neon as a byproduct of his air liquefaction business, and in December 1910 Claude demonstrated modern neon lighting based on a sealed tube of neon. In 1915 a U.S. patent was issued to Claude covering the design of the electrodes for neon tube lights; this patent became the basis for the monopoly held in the U.S. by his company, Claude Neon Lights, through the early 1930s. Around 1917, Daniel Moore developed the neon lamp while working at the General Electric Company. The lamp has a very different design from the much larger neon tubes used for neon lighting. The difference in design was sufficient that a U.S. patent was issued for the lamp in 1919. A Smithsonian Institution website notes, "These small, low power devices use a physical principle called coronal discharge. Moore mounted two electrodes close together in a bulb and added neon or argon gas. The electrodes would glow brightly in red or blue, depending on the gas, and the lamps lasted for years. Since the electrodes could take almost any shape imaginable, a popular application has been fanciful decorative lamps. Glow lamps found practical use as indicators in instrument panels and in many home appliances until the widespread commercialisation of Light-Emitting Diodes (LEDs) in the 1970s." Graph showing the relationship between current and voltage across a neon lamp. 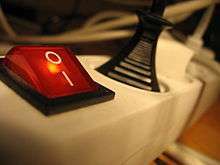 A small electric current (for a 5 mm bulb diameter NE-2 lamp, the quiescent current is about 400 µA), which may be AC or DC, is allowed through the tube, causing it to glow orange-red. The gas is typically a Penning mixture, 99.5% neon and 0.5% argon, which has lower striking voltage than pure neon, at a pressure of 1-20 torr. The lamp glow discharge lights at its striking voltage. The voltage required to sustain the discharge is significantly (~30%) lower than the striking voltage. This is due to the organization of positive ions near the cathode. Neon lamps operate using a low current glow discharge. Higher power devices, such as mercury-vapor lamps or metal halide lamps use a higher current arc discharge. Low pressure sodium-vapor lamps use a neon Penning mixture for warm up and can be operated as giant neon lamps if operated in a low power mode. Once the neon lamp has reached breakdown, it can support a large current flow. Because of this characteristic, electrical circuitry external to the neon lamp must limit the current through the circuit or else the current will rapidly increase until the lamp is destroyed. For indicator-sized lamps, a resistor typically limits the current. In contrast, larger sized lamps often use a specially constructed high voltage transformer with high leakage inductance or other electrical ballast to limit the available current (see neon sign). When the current through the lamp is lower than the current for the highest-current discharge path, the glow discharge may become unstable and not cover the entire surface of the electrodes. This may be a sign of aging of the indicator bulb, and is exploited in the decorative "flicker flame" neon lamps. However, while too low a current causes flickering, too high a current increases the wear of the electrodes by stimulating sputtering, which coats the internal surface of the lamp with metal and causes it to darken. The potential needed to strike the discharge is higher than what is needed to sustain the discharge. When there is not enough current, the glow forms around only part of the electrode surface. Convective currents make the glowing areas flow upwards, not unlike the discharge in a Jacob's ladder. A photoionization effect can also be observed here, as the electrode area covered by the glow discharge can be increased by shining light at the lamp. In comparison with incandescent light bulbs, neon lamps have much higher luminous efficacy. Incandescence is heat-driven light emission, so a large portion of the electric energy put into an incandescent bulb is converted into heat. Non-incandescent light sources such as neon light bulbs, fluorescent light bulbs, and light emitting diodes are therefore much more energy efficient than normal incandescent light bulbs. Green neon bulbs can produce up to 65 lumens per watt of power input, while white neon bulbs have an efficacy of around 50 lumens per watt. In contrast, a standard incandescent light bulb only produces around 13.5 lumens per watt. Small neon lamps are most widely used as indicators in electronic equipment and appliances, due to their low power consumption, long life, and ability to operate on mains power. Most small neon (indicator-sized) lamps, such as the common NE-2, have a break-down voltage of around 90 volts. When driven from a DC source, only the negatively charged electrode (cathode) will glow. When driven from an AC source, both electrodes will glow (each during alternate half cycles). These attributes make neon bulbs (with series resistors) a convenient low-cost voltage tester. By examining which electrode is glowing they can reveal whether a given voltage source is AC or DC, and if DC, the polarity of the points being tested. The breakdown feature of neon lamps allows them to be used as very simple voltage regulators or overvoltage protection devices. In the 1960s General Electric (GE), Signalite, and other firms made special extra-stable neon lamps for electronic uses. Like other gas discharge lamps, the neon bulb has negative resistance; its voltage falls with increasing current after the bulb reaches its breakdown voltage. Therefore, the bulb has hysteresis; its turn-off (extinction) voltage is lower than its turn-on (breakdown) voltage. This allows it to be used as an active switching element. Neon bulbs were used to make relaxation oscillator circuits, for low frequency applications such as flashing warning lights, stroboscopes tone generators in electronic organs, and as time bases and deflection oscillators in early cathode ray oscilloscopes. Neon bulbs can also be bistable, and were even used to build digital logic circuits such as logic gates, flip-flop, binary memories, and digital counters. At least some of these lamps had a glow concentrated into a small spot on the cathode, which made them unsuited to use as indicators. These were sometimes called "circuit-component" lamps, the other variety being indicators. A variant of the NE-2 type lamp, the NE-77, had three parallel wires (in a plane) instead of the usual two. It was also intended primarily to be a circuit component. Neon lamps have been historically used as microwave and millimeter-wave detectors ('plasma diodes' or GDDs- Glow Discharge Detectors) up to about 100 GHz or so and in such service were said to exhibit comparable sensitivity (of the order of a few 10s to perhaps 100 microvolts) to the familiar 1N23-type catwhisker-contacted silicon diodes once ubiquitous in microwave equipment. More recently it has been found that these lamps work well as detectors even at sub-millimeter ('terahertz') frequencies and they have been successfully used as pixels in several experimental imaging arrays at these wavelengths. In these applications the lamps are operated either in 'starvation' mode (to reduce lamp-current noise) or in normal glow discharge mode; some literature references their use as detectors of radiation up into the optical regime when operated in abnormal glow mode. Coupling of microwaves into the plasma may be in free space, in waveguide, by means of a parabolic concentrator (e.g., Winston cone), or via capacitive means via a loop or dipole antenna mounted directly to the lamp. Although most of these applications use ordinary off-the-shelf dual-electrode lamps, in one case it was found that special 3 (or more) electrode lamps, with the extra electrode acting as the coupling antenna, provided even better results (lower noise and higher sensitivity). This discovery received an application patent (Kopeika et al.). The digits of a Nixie tube. Neon lamps with several shaped electrodes were used as alphanumerical displays known as Nixie tubes. These have since been replaced by other display devices such as light emitting diodes, vacuum fluorescent displays, and liquid crystal displays. Since at least the 1940s, argon, neon, and phosphored glow thyratron latching indicators (which would light up upon an impulse on their starter electrode and extinguish only after their anode voltage was cut) were available for example as self-displaying shift registers in large-format, crawling-text dot-matrix displays, or, combined in a 4x4, four-color phosphored-thyratron matrix, as a stackable 625-color RGBA pixel for large video graphics arrays. Multiple-cathode and/or anode glow thyratrons called Dekatrons could count forwards and backwards while their count state was visible as a glow on one of the numbered cathodes. These were used as self-displaying divide-by-n counter/timer/prescalers in counting instruments, or as adder/subtracters in calculators. In 1930s radio sets, neon lamps were used as tuning indicators, called "tuneons" and would give a brighter glow as the station was tuned in correctly. Because of their comparatively fast response time, in the early development of television neon lamps were used as the light source in many mechanical-scan TV displays. Novelty glow lamps with shaped electrodes (such as flowers and leaves), often coated with phosphors, have been made for artistic purposes. In some of these, the glow that surrounds an electrode is part of the design. Neon indicator lamps are normally orange, and are frequently used with a coloured filter over them to improve contrast and change their colour to red or a redder orange, or less often green. They can also be filled with argon, krypton, or xenon rather than neon, or mixed with it. While the electrical operating characteristics remain similar, these lamps light with a bluish glow (including some ultraviolet) rather than neon's characteristic reddish-orange glow. Ultraviolet radiation then can be used to excite a phosphor coating inside of the bulb and provide a wide range of various colors, including white. A mixture of 95% neon, 2.5% krypton, and 2.5% argon can be used for a green glow, but nevertheless "green neon" lamps are more commonly phosphor-based. ↑ Weeks, Mary Elvira (2003). Discovery of the Elements: Third Edition (reprint). Kessinger Publishing. p. 287. ↑ "Lamp Inventors 1880-1940: Moore Lamp". The Smithsonian Institution. 1 2 C.R. Dougherty, T.D. Foulke, J.D. Harden, T.L. Hewitt, F.N. Peters, R.D. Smith, and J.W. Tuttle, General Electric Glow Lamp Manual, 2nd ed. (General Electric Company, 1966), Chapter 1: Physics and characteristics of glow lamps: Theory of gaseous conduction in the glow lamp, pages 1-3; see Fig. 1.1, Characteristic curve of the neon lamp. 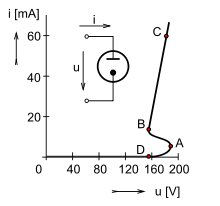 In the current vs. voltage curve in this article, the portion of the curve between points A and B correspond to the points E and F in Fig. 1.1. From p. 2: "After breakdown occurs the lamp passes through a transition region EF which is an unstable region of operation. The shaded portion indicates the region in which oscillation can occur. This region is often referred to as the negative resistance region, since voltage decreases as current increase[s], contrary to normal behavior in a resistive element. [...] As the current through the lamp is allowed to increase further, the lamp enters the normal glow discharge region represented by section FG [where the point G corresponds to the point C in the current vs. voltage graph of this article] in Fig. 1.1 where voltage changes a minimum amount with a change in current. … In the normal glow region the glow is confined to a portion of the cathode surface and the amount of cathode surface covered by the glow is somewhat proportional to the tube current." ↑ Thielen, Marcus (2006-02-10). "LED or Neon". Retrieved 2008-12-30. ↑ Raju, Gorur Govinda (2006). Gaseous Electronics: Theory and Practice. Taylor and Francis. p. 453. ISBN 0849337631. ↑ Daugherty, C. L.; Tuttle, J.W. ; et al. (1965). G.E. Glow Lamp Manual, 2nd Ed. Cleveland, Ohio: General Electric. p. 2. 1 2 3 Bauman, Edward (1966). Applications of Neon Lamps and Discharge Tubes. USA: Carleton Press. p. 18. ↑ Dance, J. B. (1968). Cold Cathode Tubes. London: Iliffe. p. 7. 1 2 Gottlieb, Irving M. (1997). Practical Oscillator Handbook. Elsevier. pp. 69–70. ISBN 0080539386. ↑ Burton, Walter E. (February 1948). "Magic with neon glow lamps". Popular Science. New York: Popular Science Publishing Co. 152 (2): 194–196. ISSN 0161-7370. Retrieved April 14, 2014. William G. Miller, Using and Understanding Miniature Neon Lamps (Indianapolis, Indiana: Howard W. Sams, 1969). A.A. Vuylsteke, "Neon lamp flip-flop and binary counter," Electronics, vol. 26, page 248 (April 1953). M.S. Raphael and A.S. Robinson, "Digital storage using neon tubes," Electronics, vol. 29, pages 162-165 (July 1956). J.C. Manley and E.F. Buckley, "Neon diode ring counter," Electronics, vol. 23, pages 84-87 (January 1950). R.L. Ives, "Neon oscillator rings," Electronics, vol. 31, pages 108-115 (10 October 1958). C.E. Hendrix and R.B. Purcell, "Neon lamp logic gates play tic-tac-toe," Electronics, vol. 31, pages 68-69 (20 June 1958). ↑ "Philips, 1968: ZC1050 data sheet" (PDF). Retrieved 10 May 2013. ↑ "Melz, 1944: ИНДИКАТОР ИТМ2-М data sheet" (PDF). Retrieved 9 May 2013. ↑ "ETL: GCA10G/GSA10G data sheet" (PDF). Retrieved 10 May 2013. ↑ "Tuneon". Radiomuseum. Retrieved 12 October 2015. ↑ Yen, William M.; Yamamoto, Hajime (2007). Phosphor handbook. CRC Press. p. 442. ISBN 978-0-8493-3564-8. ↑ Bogard, Scott. "Plasma Globe Colors". Scott Bogard's E-Profile. Retrieved 22 April 2016. Wikimedia Commons has media related to Neon lamps.